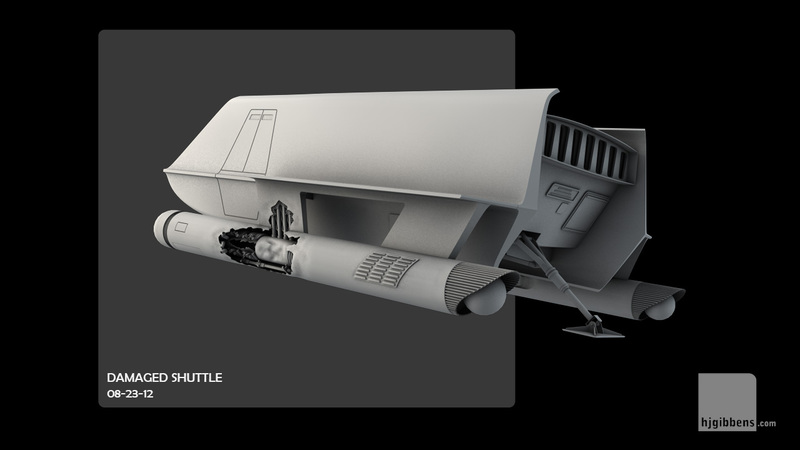 First up some work for the folks over at Starship Farragut. 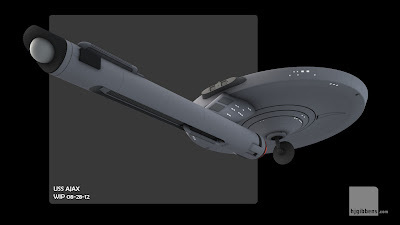 I sent over my TOS shuttle model to Michael Struck at Neo F/X for use in the latest Farragut episode 'The Price of Anything'. He made some modifications to bring it closer to the original studio prop - slight changes to the paneling details as well as hollowing out the nacelle end caps. Turns out the poor shuttle is in for a bit of a rough time. 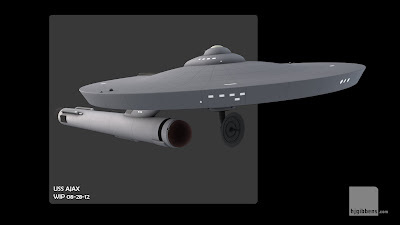 Initially the nacelle and support strut needed to be damaged as if hit by weapons fire. 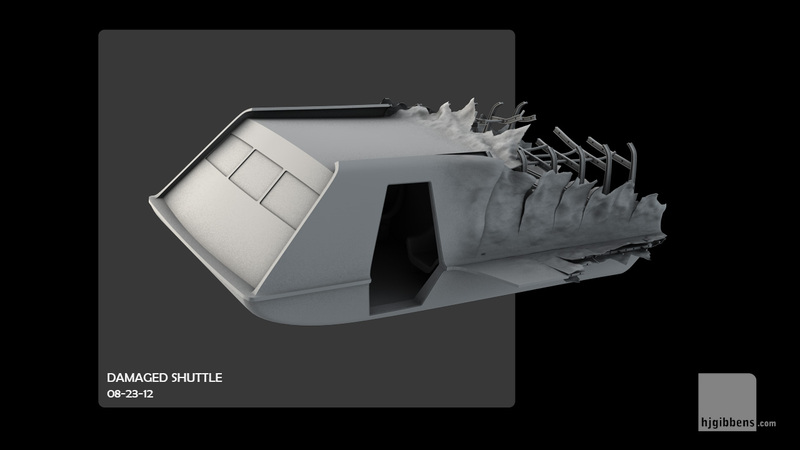 Then it crashes planetside and is reduced to a smoking wreck - lots of fun with Modo's sculpting tools. 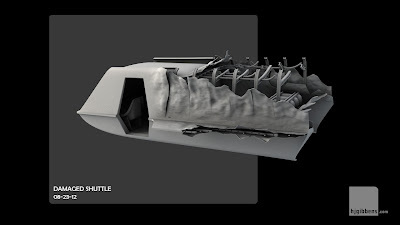 I initially looked at the shuttle cutaway in the Enterprise Haynes manual for guidance, but ended up producing my own interpretation of the internal airframe so we have something to see after peeling back the panels. Given me a few ideas for producing hull damage for bigger ships, which I may well need in the near future. I had also been eyeing up having another pass at the Ajax. I still wasn't quite happy with the last version, and after looking at Tobias Richter's work on the new Phase II Enterprise, I definitely felt like I needed to try and lift my game a bit. 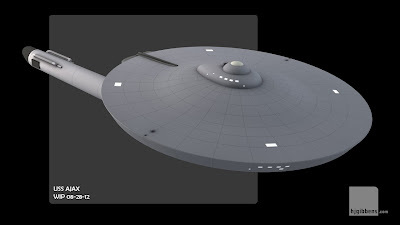 I had initially wanted to rebuild the primary hull to make it easier to UV map, but after several attempts to produce a version that I could cylindrically UV map I gave that idea up as a bad joke. Both the saucer and the connecting dorsal are based on P-Sub cages that make for a more even polygon distribution when frozen. 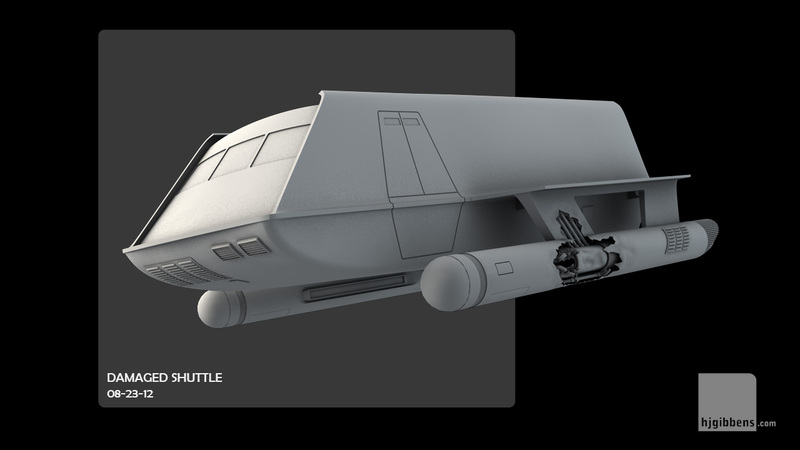 I have kept with my previous plan of modeling the grid lines/paneling, but have taken on board the critique that the previous version was to pronounced (thanks EG180!). I want to add more nurnies and panel detail to the mesh and perhaps push the model beyond the original 60's 11 foot miniature constraints that were the original intention. This version still has the 11 footer's bridge and BC deck layout - need to remodel the FJ version and swap them over. Thanks, Derek. Definitely something of a passion - everybody has to have one!